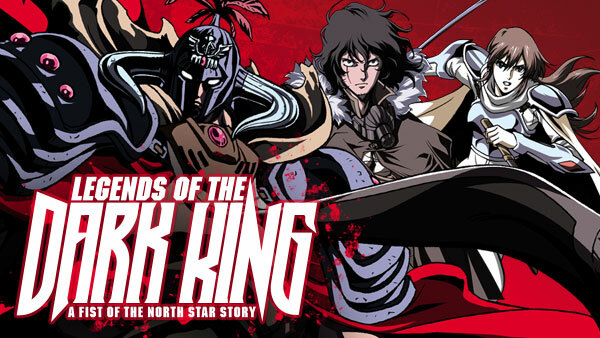 Sign up now to stream Legends of the Dark King ~ A Fist of the North Star Story, subs, tons of dubs, OVA's, simulcasts, plus the all new Dubcast℠ editions and more! The world is now a wasteland, filled with desperate villagers, marauding bandits, and ruthless warriors. One warrior, Raoh, will challenge the Demon King to take his place. E1 | My Fists are for the Heavens! E2 | Kings Understand Kings! To counter Raoh’s attack, the king sends wild horses to destroy him. Unknown to the king, these horses have a special connection with Raoh and his powers. E3 | No Castle Can Stand Against Me! A woman, Sakuya, comes forward with a plan to take the castle. She’s quite mysterious, with an unknown past and unproven ability, it’s unclear if she can be trusted. E4 | These Fists are for Other People! Sakuya’s plan gets Raoh into the castle. From there, he can reach the king and claim his throne. But first, Raoh must travel through the castle’s traps and its dangers. Raoh may have found an ally, when he is reunited with his long lost brother. However, unlike Raoh, his brother’s hands are meant to heal, not harm. E6 | The Demon Awakens! Raoh continues to search for followers that can strengthen his force. He meets a pacifist, who was once a fierce warrior. Raoh must convince him that it’s time to take action. E7 | The Blue Wolf Tears Across The Earth! Raoh finally meets Ryuga, a man who may be more ruthless and skilled than himself. E8 | Wailing Resounds Through the Darkness! Reina is concerned for her brother; fearing terrible things may happen after he battles Igor the Lion King. E9 | A Woman's Battle! Reina wants to prove her strength and ruthlessness to Raoh. In doing so, she has also put herself into a dangerous situation. E10 | Fists Smashed in Hot Sand! Raoh and his forces find an oasis-like village in the desert. While it looks perfect, under the surface evil begins to take control of the people, including Raoh’s generals. E11 | The Holy Emperor Cometh! Raoh’s enemies, lead by his greatest nemesis, the Holy Emperor, have formed an alliance to prevent Raoh from gaining power. The Emperor will stop at nothing to get his way. E12 | The King of Fist's Office is Falling! The war is becoming bloodier and more costly. Juda, and Souther’s strong allegiance have caused an escalation in the fighting. E13 | I Walk the Path of the Heavens! The North Star and the South Star are about to collide in a final battle. Only the strongest shall prevail, resulting in either a new hope or ultimate destruction.